Inspired by a wee miniature wire hair dachshund called Finnbar MacBrigadoon who runs the roost at Hugo & Otto, his favourite pastime is barking at Furballs in the garden and chasing off the Pheasants who dare to infiltrate his boundaries. 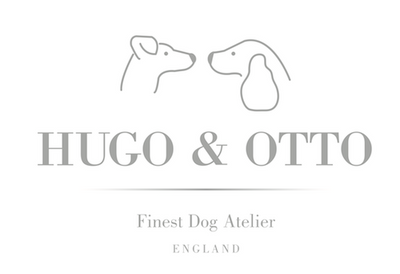 Hugo & Otto's Finnbars Dream Dog Collar is handmade in our studio by our master rope makers. Paul and Ian individually handcraft our rope collections from the highest grade and quality British marine grade braid on braid rope used by International yachtsmen. Finnbars Dream Collar is a luxury dog collar made in a silky soft red braid on braid which is super strong, made to withstand the elements and can also be washed. We hot splice and sew the rope together and then whip over in a red flat whipping cord with a beautiful Turks head knot in stunning black cord with 2 more black Turks heads at each end of the collar. Hugo & Otto standard fit collars are available in a range of sizes and designed to fit loosely around your dog's neck and rest on the collar bone but should not slip off, we recommend that you measure using our guidelines below and choose a collar 2cm above your measurement. Finnbars Dream Collar is available with a matching City Lead or a matching 2 x adjustable double lead. Bespoke Sizes please select bespoke & the following size ranges - then on check out please fill in the size measurement and requirement in the special instructions box. For bespoke sizing we can make your dog collar any size and from point of order we expect to hand make and send to you within 10 days and will email you to confirm expected shipping date to your address. It is important that you use a soft tape measure and measure your dog's neck and not the existing collar. Please also do not pull the tape tight when measuring ensure that the tape is where the collar will sit on your dogs neck, keep it comfortable and place 2 fingers between the tape and the neck to give the growth room. When ordering the standard sizes order up to 2 cm larger to allow the collar to sit comfortably on the collar bone. You should not be able to pull the collar easily over your dog's head it should be secure enough when fitting so that your dog cannot pull free. If you do have any questions please email us on sales@hugoandotto.com and we can advise you. The measurement when making our collars is taken from the nickel plated ring that connects the collar to the end of the opposite snap clasp (not the rope end to end).